All human communities have developed and grown expressions and traditions related to the meeting between the man and the divine throughout history. 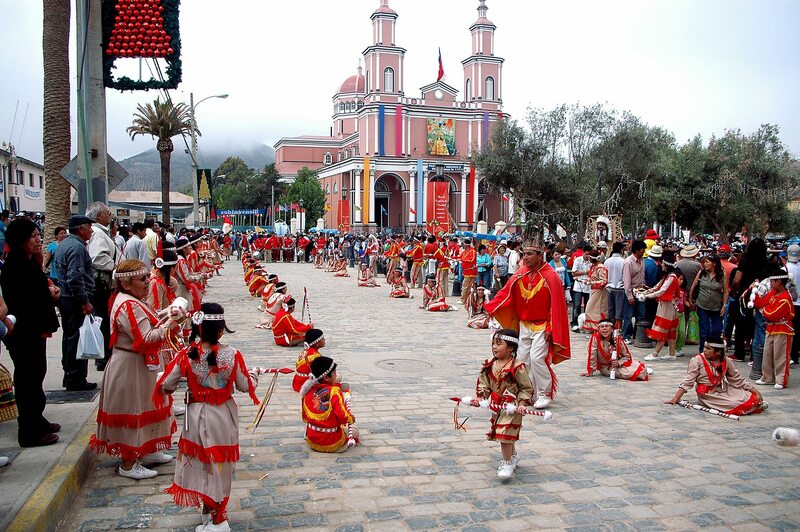 As a remaining memory of the fusion between the traditions and practices of the indigenous populations and the evangelization in the time of the Spanish Contest (16th century); colorful big festivities, ceremonial costumes, music, dance and deep faith, still remain all along Chile, displaying characteristic aspects of our popular Catholicism. 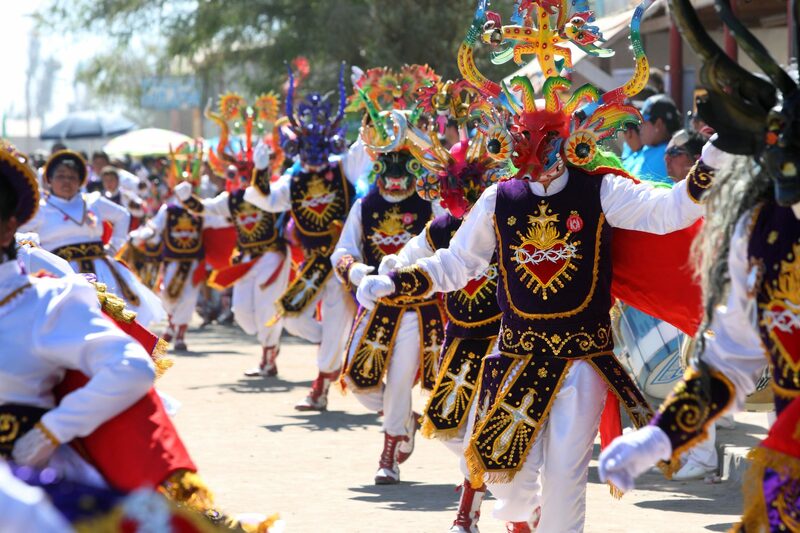 I the middle of pampa del Tamarugal takes place the “Fiesta de la Tirana”, one of the most important multicultural celebrations held in the north of the country, that turn the small town into a colorful carnival with a runway of masks, music, rituals and dances. As a result of a large history, cultural elements typical from the Chilean and Peruvian population, Atacama and Aymara people, afrodescendents, Chinese and European among others who have lived in this zone throughout the years, come together and get mixed here. The name of the “Tirana” is based on a local legend that has as the protagonist the Spanish conqueror Diego de Almagro and the daughter of a priest, Ñusta, who fought to defend her territory, receiving the name of “Tirana del Tamarugal” by her enemies. Where: Locality of la Tirana, 90km away from Iquique, in the Tarapaca Region. Arriving to the Pozo Almonte town (11km away from La Tirana) there is regular and fluid public transportation during the time of the festivity. With a history that goes back to the time of the conquest of our country, in the miner town of Andacollo, located in the Coquimbo Region, is commemorated the coronation of the Virgen de Andacollo or the “Chinita” image, with a gold crown that represents the Vatican’s recognition of the significant devotion of their believers and the miracles that she had realized to that moment. 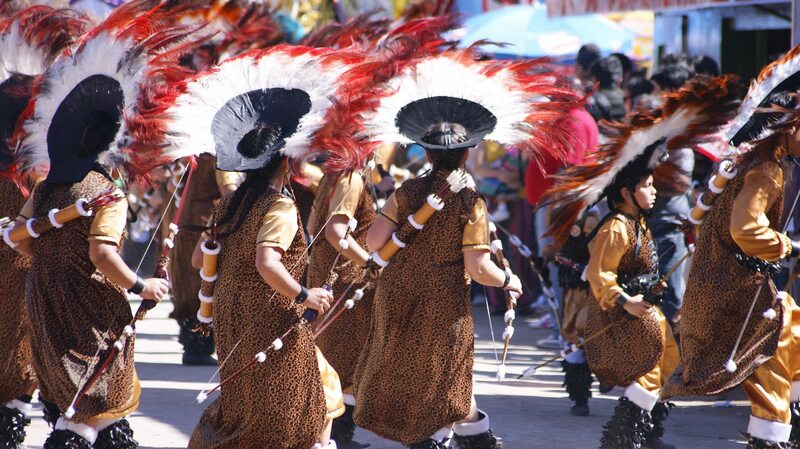 The love and faith of her believers is demonstrated with the dances of Chinos, Turbantes and Danzantes, performed by comparsas and local confraternities that take the lead of the celebration. Where: Locality of Andacollo, 56kn in the southeast of La Serena. With confusing written records and altiplanic legends, we suppose that this pilgrimage and place of devotion could be almost 200 years old. Chamarcusiño, is the start point sector of 20km of pilgrimage that go to the Virgen de las Peñas Temple, a sculpture carved in rock which is more than 1 meter and a half tall. 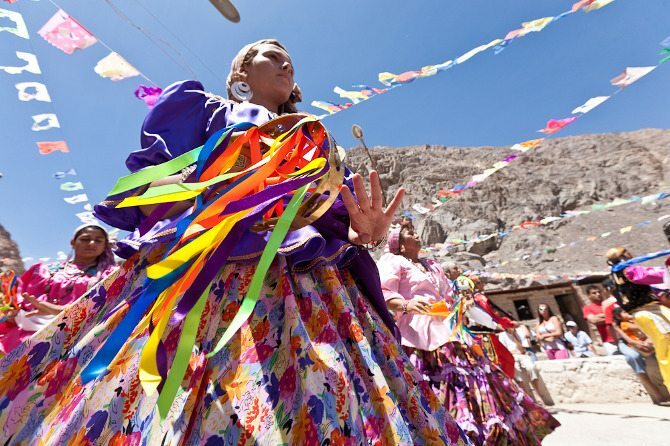 The route of adverse conditions attracts more than 40.000 wayfarers, among them religious dance companies, Bolivians, Peruvians and Chileans, who each year go to render thanks at the rhythm of the Andean wind instruments, for the favors granted or to ask the Virgin for a favor. Where: 95km to the interior of Arica, and more than 1.200 meters high, next to the San José river. The route to arrive at the sanctuary goes along the Azapa valley, to Chamarcusiño, where is located the vehicular whereabouts. Quebrada de Livilcar (archeologic route), Arica Region and Parinacota. These celebrations of the Catholic calendar, are not just the place and moment of connection of the man with the gods, they are also witness of our territory’s history. The dates may vary in some cases each year, so it’s recommended to check them before coming.